You are here: Home / A Mile In My Shoes / Running season is upon us: Social worker asks what’s your why? 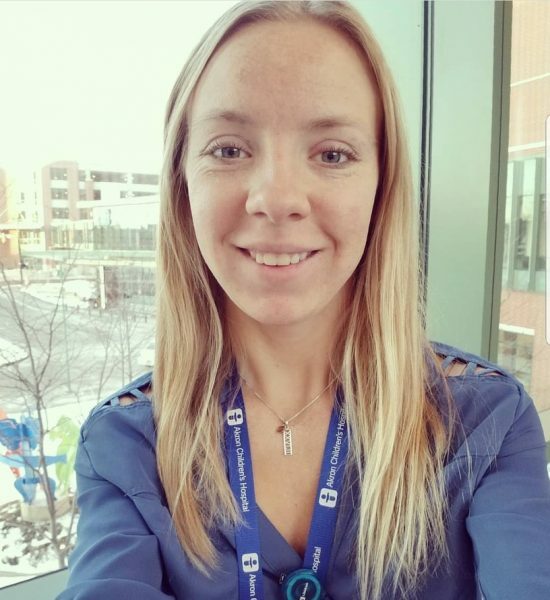 Running season is upon us: Social worker asks what’s your why? Rebecca Prather is a social worker at Akron Children’s Hospital. Signing up for a 5K race in 2014 was part of a New Year’s resolution for Rebecca Prather but, as it turns out, her year-long commitment to running became a lifestyle change that still fuels her motivation today. Rebecca finishes her first of 12 5K races in 2014. For Rebecca, finding a reason or a ‘why’ kept her focused and kept her running. After her successful resolution in 2014, she tried her first marathon in 2015 at the Akron Marathon and finished in 5 hours 30 minutes. 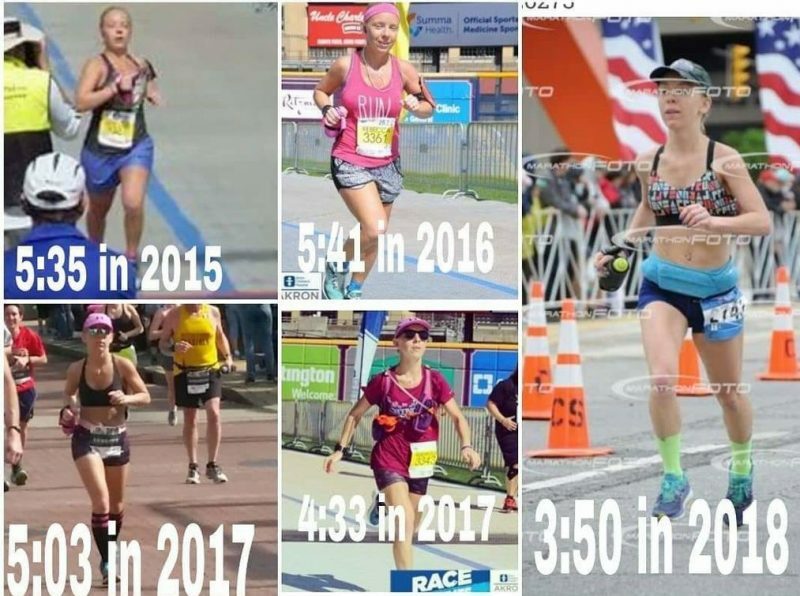 She kept setting goals and running but, in 2016, she let her nutrition slip and found herself 15 pounds heavier and 11 minutes slower at the Akron Marathon than the year before. 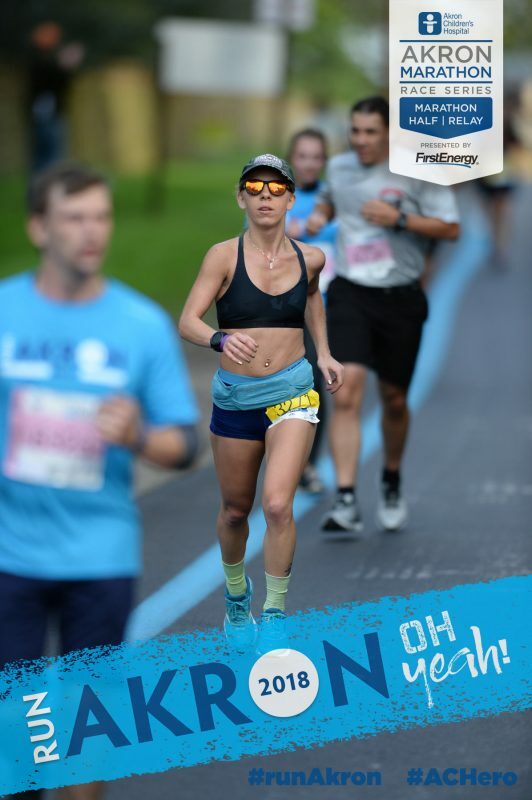 Refining her diet and making a new plan in 2017, Rebecca ran another marathon, an ultra 50K and lined up, once again, on the blue line at the Akron Marathon. The result of her efforts? An impressive comeback run of 4 hours 33 minutes. Rebecca runs multiple marathons a year to stay motivated to run all season. Rebecca recognizes, though, that the monetary commitment or deadline of an organized race doesn’t motivate everyone. Rebecca on the blue line in 2018. 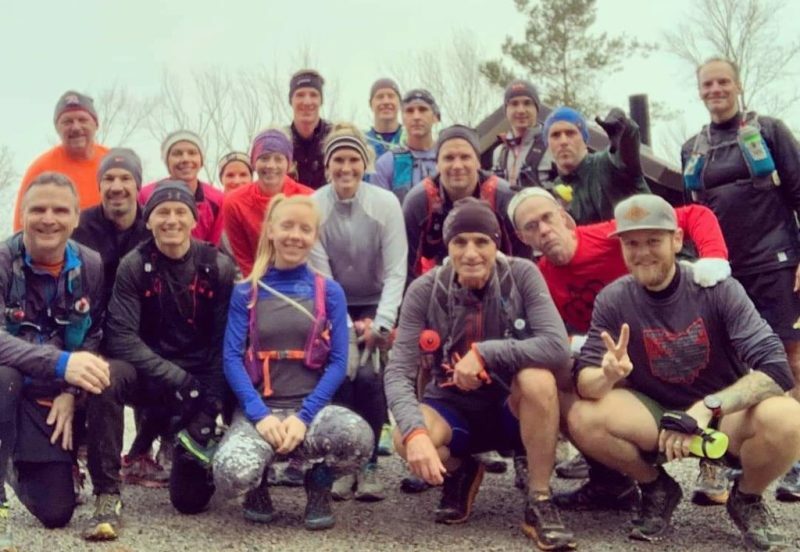 You’ll often find Rebecca on the Cuyahoga Valley National Park trails helping other runners reach their goals. “I’m helping someone right now with a training plan to get him ready for his first half marathon. If I can help someone stick to a plan, to reach that goal, it makes me feel good. I really enjoy it,” she said. Rebecca with members of the Burning River Running Club. Helping others inspired Rebecca’s career choice, too. Rebecca continues to set goals for herself to stay motivated for that next big run. 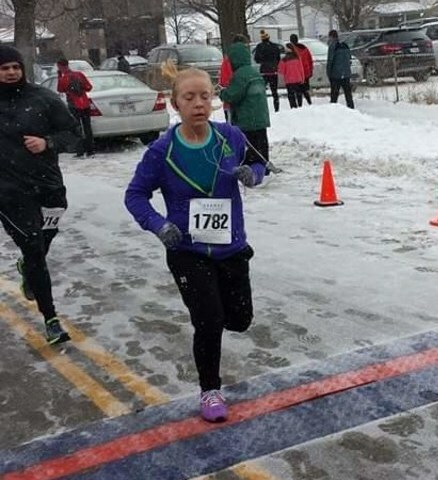 She’s earned a spot in the coveted Bank of America Chicago Marathon and is signed up for marathons in Akron and Toledo, two half marathons and the Akron Children’s Kids Are #1 Run, as well as her first 100-mile race in July. 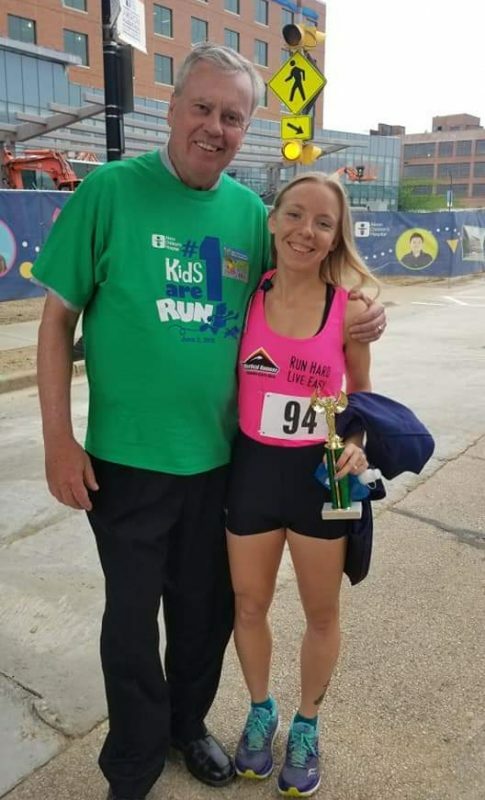 Rebecca stops for a picture with Mr. Considine after placing first overall female in the 2018 Kids are #1 Run with a time of 23 minutes 36 seconds. 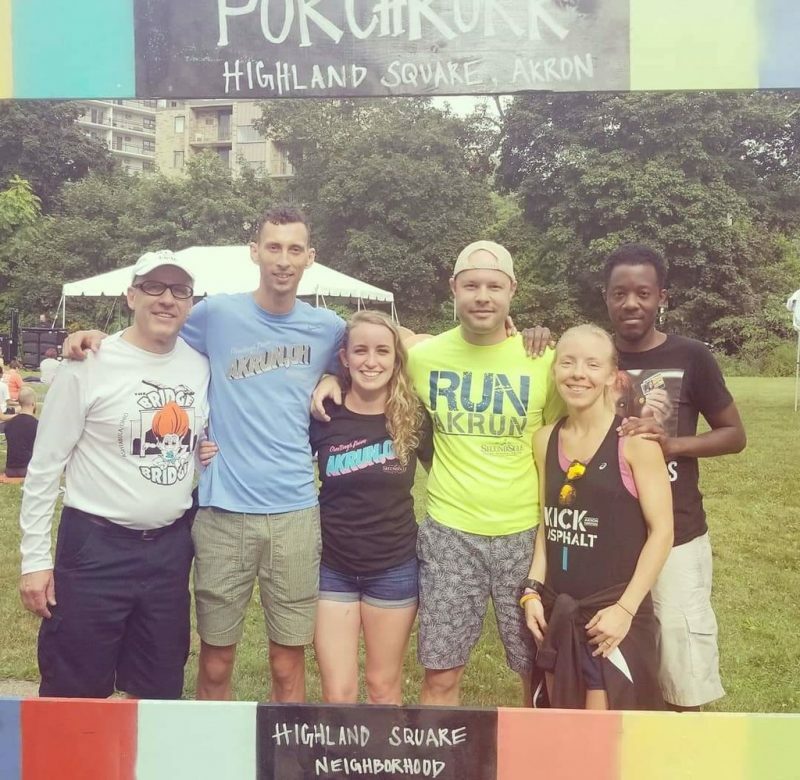 Rebecca is the race co-director for this year’s Highland Square (Akron) PorchRokr 5K.